It was three o’clock in the afternoon this Christmas eve. I was down in my basement finishing shop when I heard my wife let in my neighbor boy who cuts my grass. He is fifteen and has been cutting the grass each week for the past two years. I met him when his step-father cut down a tree in his yard. It was a dead elm tree. I heard the chain saw and crossed the street to investigate. The wood looked interesting to me and asked if I could have some. He brought over a whole trailer load as the rest was going to the dump. I found out about the boy and made a mental note that when he was a bit older to see if he would like to cut my grass. So when he turned 14 he began to cut my grass ever week. I offered to teach him some about turning and he turned a rolling pin for his mother and later turned some tops. Like most adolescents it was hard to keep his attention very long. Last summer he told me that another dead elm was coming down in the yard and would I like some. When I said yes he promptly appeared with a wheelbarrow load and left it for me. When I asked him if he would like to rough turn a bowl from the wood and put it away to dry, he readily agreed. So I guided him through the steps of using a gouge to rough turn the bowl after we had prepared the blank on the band saw. We put his name on it and placed it in a paper bag to slowly dry without checking. Now here he was at 3 PM on Christmas eve asking my wife if I was here. I knew exactly what was on his mind and said lets go out to the shop and finish that bowl. He worked carefully and diligently and by 5 PM we had the outside and inside finish turned and finished the foot and sanded it on the lathe. I then motioned for him to come with me to my basement finishing shop and we did final sanding of the foot and applied a coat of tung oil. With the oil still wet he went beaming home with his hand made Christmas gift for, I presume, his mother. He was beaming with pride as you can see in this picture taken the minute after he finished his project and before he took it home. 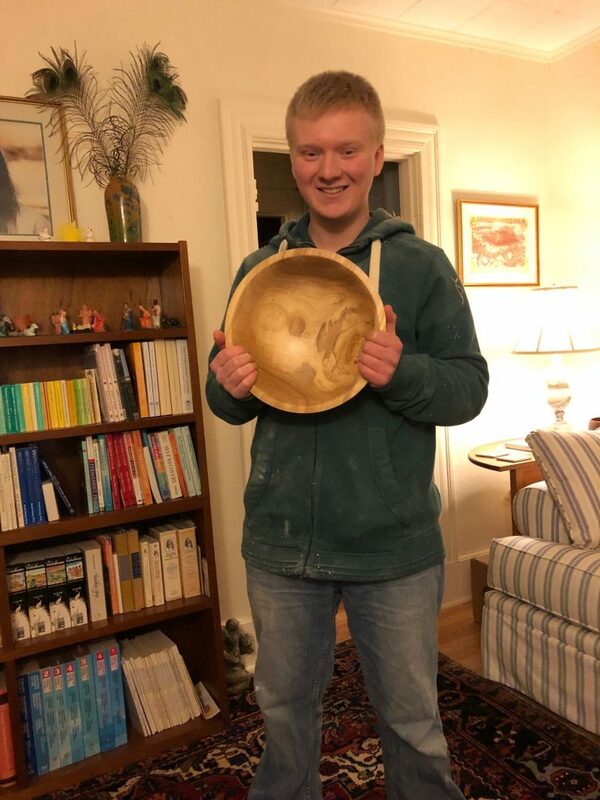 It is a fine looking bowl and you can see the pride and excitement beaming from his young face. This is why I love working with the lathe. Coming at 3 PM on Christmas eve he was able to take a gift to completion and share his excitement. I know of no other woodworking tool which can give such prompt gratification. This is particularly important to young people as they have not developed the long attention spans and the capacity for delayed gratification as their adult peers. It is also important to the adult peers. Putting a chunk of wood on the lathe and in an hour or two time, or even less, having a finished product to display or give is satisfying to any woodworker.